Back extension is a widely used exercise to strengthen the muscles on your back and protect your spine from injury. Physiotherapists apply this exercise not only in sports training, but also in medicine. Back extensions, when practiced regularly, help you get rid of round back and discomfort in the spine and give you an optimal posture. Office workers and anybody who tends to sit a lot will find this exercise very helpful in alleviating problems and symptoms associated with prolonged sitting. Initial position. Lie on your stomach and put your forehead on the exercise mat. Place your arms at your sides and press your palms on the thighs. Straighten your elbows. Put your legs together, drawing out the toes slightly. Slowly lower the trunk and head to the initial position. Repeat the exercise 10 times. Doing this exercise 3 times a week will bring definite improvements to your glutes, back and stomach muscles. 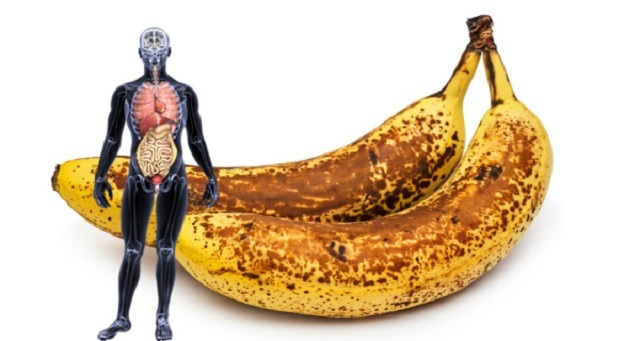 It will also positively affect internal organ functions, making you will feel much better overall. Place your arms close to your sides so you can also use the adductor muscles, particularly the latissimus dorsi and pectoralis major. Activation of the latissimus dorsi muscle is needed as it plays a key role in stabilizing the torso. 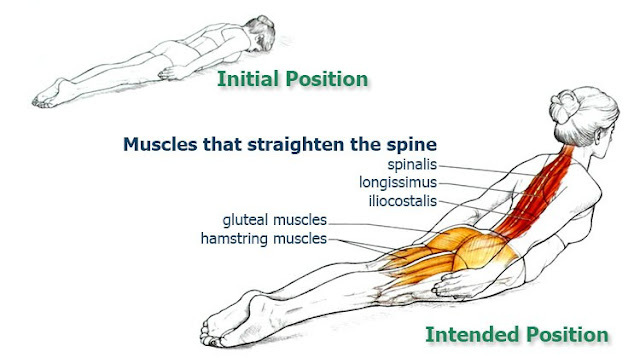 Move your body gradually back to the mat, from the lower spine to the top, using back extensors to control the lowering. 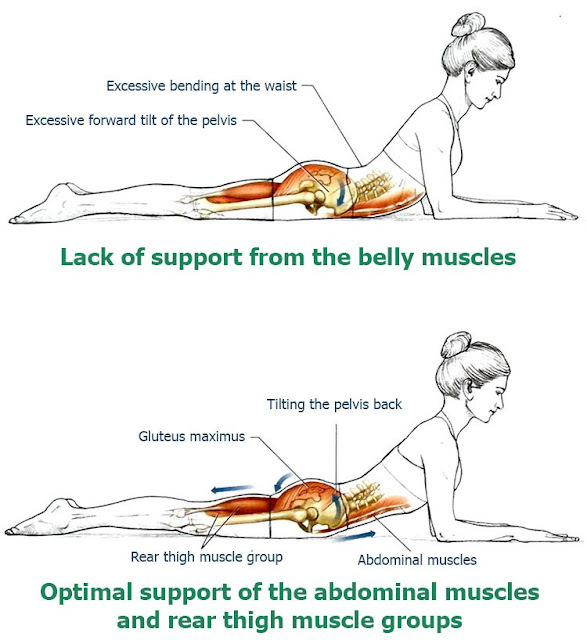 The abdominal muscles at this time provide support for the spine. By straining the muscles of the abdomen and pulling them up, we tilt the pelvis back into position. Make sure to firmly press the pelvis to the mat and pull your stomach and abdominal muscles to direct the effort toward your chest, as shown on the illustration just above. This will not allow the pelvis to tilt forward and it will remove unnecessary tension in the lumbar region. The ability to use your abdominal muscles to stabilize the lumbar region is necessary to optimally perform this and more complex exercises associated with back extension.